Heartbreak is more than just an emotional defeat; to some the pain is very real. At one point or another, everyone must experience this mind numbing feeling (unless you confine yourself to a house and never interact with even a pet) but that's not the norm and you're probably not reading this article if you've had that kind of sheltered life. Heartbreak can be caused by many different circumstances and that's what makes this emotion easily recognized by nearly every person on the planet. It can result from the loss of a loved one, a partner, a friend and even a close pet. Or it can be caused from disappointment, betrayal or a change from known surroundings. It might not even be a loss at all but a sense of loss, or the realization that the love of the person you care most for is drifting far from where it had always been. Love, in the same perspective as heartbreak, neither has a corrective definition nor specific amplitude implied by the physical word itself. There's a never-ending limit to the definition of love because there are so many things we love and in many different ways. There's friendship love, love for animals and possessions, love for music or hey, even food. Then there's that kind of love that is so overwhelming perfect, passionate and meaningful, a love that you have never before been able to achieve. This is the love we're going to be talking about throughout this article, but before we can continue on, we must first understand why we as humans are constantly searching to fulfill this emotion. Photo by Me! Isn't it cool? A part of the desire comes from what we find most joyful in life. If you search for this answer, and look upon previous actions objectively, it's simple to say that we are satisfied by making others happy. We receive complete satisfaction from doing things for others, and this feeling increases with the intensity of love we feel towards that specific person or thing. When you lose someone you love, you have lost the sense of purpose acquired by the relationship between them and yourself. You lose the purpose you felt when doing simple things to make them smile, and making yourself joyful in return. The cycle should continue endlessly, but as we know that could only occur in a perfect world, which this is not. Heartbreak happens, and it changes who we are for the better (in most cases) and so will it be for the rest of our lives and next. "We of course equate the pain of loss to the intensity of the love, but that is not what is behind the pain. The more you love and feel loved, the greater the increase of your sense of purpose because when you do something for just anyone and they do not appreciate it; your sense of purpose is not completely satisfied. It requires seeing who you are helping, and their appreciation to make it complete." says personal developer, David Samuel. Continuous searching comes from our need not only to self imply a purpose of being, but also to find the "one" that will make us feel needed, appreciated, and most importantly, well, loved. We act in some silly ways just to be able to have a someone that we can call our own. We act crazy, we do stupid things, and we make regrettable mistakes, but hey, that's just falling in love. We start picturing the rest of days together, share every ounce of pointless information we can recall, and create a bond greater than ever perceived, all before a thought of those three little words comes to mind. Anyone who's ever gone through the emotional pain of a heartbreak more often than not can express the experience through the form of some type of physical pain. Emotions affect physical health in more ways than many realize, but how does the body physically feel the emotional loss; in other words, what is it that brings pain to the heartbreak? "Pain is the way the mind responds to trouble inside the body," says Alex Zautra, a professor of psychology at Arizona State University. "Emotion is the same way. Whether you feel love or sadness is also a response to something you feel outside the body. With pain it is a closer-in response, to something inside the body, but it is a response in an attempt to learn about and motivate recovery." physical sickness and pain. You lose a part of yourself when connections are lost, and its not far-fetched to say that you feel completely empty inside. There's an ache, a deep ache that erupts from the inside of our bodies longing for the past. The pain is real and there's no other way to describe how bad it really hurts than to name it heartbreak. Its a longing for the past and the pain of feeling completely empty and abandoned. It makes it hard to get up in the morning and to get through the day, but all wounds are inevitably healed through time, and thus you hope for the future to approach quicker. When a person feels secluded or feels loss, changes in the brain's blood flow occur. The anterior cingulate cortex (responsible for regulating physical pain distress) becomes more active during these times. This is seen in victims of depression who also register physical pain due to the detection of nociception, which triggers a variety of responses, one which results in the experience of pain. People who are depressed or who are under extreme stress are more at risk to develop heart disease and other cardiovascular diseases based on research that found depression to help in thickening artery walls . Although most pain of heartbreak is not that severe, it still has a profound effect on daily living. Symptoms of breakup might include loss of appetite, insomnia, headaches, stomachaches, nausea, a ton of tears, occasional nightmares, alcohol/substance abuse, depression, eating disorders, panic attacks, loss of interest, fatigue, loneliness and hopelessness. 1.Shock and Denial- you may deny the reality of the situation; this provides emotional protection from feeling overwhelmed by the situation. The shock of loss allows a state of emptiness to move in, clouding most judgment. 3. Anger and Bargaining- lashing out is a common form of attempting to release all unspoken emotions. This is the stage where the “why why why? !” questioning comes in. The pleas for returned love run rapid, trying to bargain with fate or with the person who was just lost. absorb your entire sense of being, leaving feelings of emptiness. This feeling occurs when you finally realize and accept the magnitude of your loss. Isolation from people is exceedingly normal, and offers a time to reflect on the past. 5. Acceptance and an Upward Turn- The feelings of depression lift slightly and life becomes possible to survive without that person so deeply intertwined with each activity. The days are a little easier to shuffle through, and you see the possibility of continuation. The reality of the situation is fully accepted and, although happiness may not return for some time, the ability to move forward has occurred. According to studies on heartbreak and how it affects people, most of whom women, a connection can be found between emotional pain and a literal form of heartbreak- heart attack. Depression is documented to affect its host physically and so is the case with heartbreak. 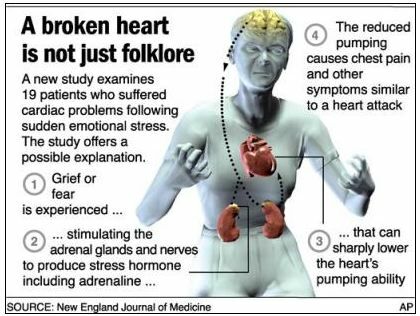 The emotional stress is harmful and is said to possibly be cause for what's known as Broken Heart Syndrome, cleverly laid out in the picture below. Takotsubo Cardiomyopathy is a sudden temporary weakening of the myocardium, producing something similar to a heart attack. When the body becomes overwhelmed, primarily due to stress, hormones such as metanephrine and normetanephrine are released in excess with addition to proteins such as neuropeptide Y, brain natriuretic peptide, and serotonin. "Our hypothesis is that massive amounts of these stress hormones can go right to the heart and produce a stunning of the heart muscle that causes this temporary dysfunction resembling a heart attack," says cardiologist Ilan Wittstein, M.D., an assistant professor at The Johns Hopkins University School of Medicine and its Heart Institute. "It doesn't kill the heart muscle like a typical heart attack, but it renders it helpless." The best thing for a broken heart is to be patient and allow time to settle all unresolved feelings. Talking about your feelings with friends or family help to smooth the passage of the loss, as will allowing yourself time to reflect on all feelings and answer questions you may have for yourself. Keeping busy with hobbies you're passionate about and trying new things also keeps your mind busy during hard times. Get a group of friends together and watch a movie, or if you're more to yourself, try a quiet walk through a forest or even around the neighborhood. Give yourself time, and do things that make you happy. You are your own best friend and it's important that you accept who you are and like who you are as a person before you expect anyone else to.